This blog post contains spoilers for the Captain America comics, and Game of Thrones (sort-of). I’m having a busy year. I’ve finished the final draft of one book and the first draft of another. Today, I reached the 25,000 word mark on my latest work-in-progress, The Only Thing That Never Burns In Hell. It’s the story of a young woman who, desperate for a job and unable to find one anywhere else, ends up accepting a role as the Librarian of Hell. It’s a bit of a departure from my usual stuff – less epic fantasy, more urban fantasy, laced with satire and dark humour, and it’s been fun to write so far. Writing stories can be fun, but it can also be frustrating, and I’m sometimes nagged by the question: does what I’m doing actually matter? Obviously, I enjoy it – but will it ever matter to anybody else? Well, I hope so. And, looking around the parts of the internet I frequent, I see that stories obviously matter a lot, to a lot of people. The Marvel character Captain America, aka Steve Rogers, has had focus on him lately. After the release of the film Captain America: Civil War, there’s been a Twitter campaign to #GiveCaptainAmericaABoyfriend (I have to confess I had a moment of confusion at that hashtag, until I remembered that apparently some people still think Steve and Bucky are Just Really Good Friends). Marvel’s response to this was not to give Captain America a boyfriend, but to make him a Nazi. Yep, you read that right. The latest issue of the Captain America comic outs him as a member of Hydra – the fictional uber-Nazi evil cult he’s been fighting since the 1940s. Some people are quite upset about this, and I can see why. 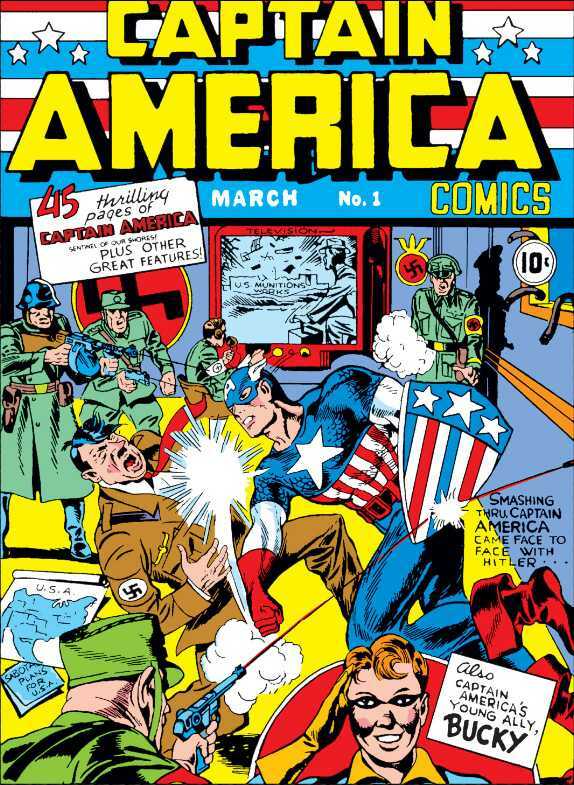 Captain America, after all, is the brainchild of two Jewish creators and was punching Hitler in the face long before Pearl Harbor. Making him into a Nazi for some cheap shock-value publicity is therefore… insensitive. For many people, he’s not just a super-hero, he’s a hero they can identify with, and making him evil feels like a personal betrayal. The very first Captain America comic, published in December 1940 – a year before the US entered WW2. Stories can be incredibly powerful. They might not be real, but the emotions they rouse – whether rage, sorrow, joy, terror, or anything else – certainly are. As I weave my own tales, I can dream of one day rousing a fraction of these passions. Writing stuff is easy, except for one thing: choosing which words to use. And I think fantasy authors have it doubly difficult in this regard. We’re describing our own worlds, which are often completely unlike the real world: they’ve got different cultures, a different history, they’ve got magic and mythical beasts. But in order to describe these worlds, we’re restricted to Earth-languages (well, ok, you can always make up your own languages like Tolkien did, but then you’ve still got to translate back into English or else nobody will understand your books). And a problem many fantasy writers encounter is this one: all words, in any language, have a history behind them. There are the original word-roots, and then there are the extra layers of meaning and nuance they accumulate through repeated use in a specific cultural context. Uproot these words, put them in a different context, and they can end up sounding weird. Here’s an example for you: while reading a scene of airships attacking a city in the Shadows of the Apt series by Adrian Tchaikovsky, I was struck by his use of the word ‘zeppelin’ to describe these machines. Now, to me, this word sticks out from a fantasy context in a way the more neutral ‘airship’ doesn’t. It’s too historically specific, too German, too World War I, too Stairway to Heaven. Using it in a world where neither Jimmy Page nor Ferdinand Adolf Heinrich August Graf von Zeppelin ever lived just feels, well, wrong. But it can be difficult to avoid such terms. In my first book, The Heartland of the Winter, I spent ages agonising over my use of the phrase ‘Adam’s Apple’ – since Adam and Eve were never a thing in my world, surely I should call it something else? But ‘laryngeal prominence’ would surely cause puzzlement, while any circumlocution along the lines of ‘male throat lump’ just sounds strange and calls more attention to itself. I considered cutting out the reference entirely, before eventually deciding to leave it in and hope nobody would mind. More recently, in The Silvergreen Sea, I struggled with ‘hell-bent’ when the culture doesn’t believe in ‘hell’ as such, and ‘stalemate’ when they don’t play chess. What’s to be done? Well, generally in fantasy we assume there’s some kind of Translation Convention in place – the characters are talking their own language, and everything has been translated into idiomatic English for the reader’s convenience. This is all very well but can still sometimes be a bit jarring when you get people casually referring to things that don’t actually exist in their world. One clever thing you can do is use things like idioms and swear words as part of your world-building: think of the way George RR Martin has his characters say things like ‘Seven Hells!’ and ‘The Others take it!’ Since many real-life curse words are religious in origin, this can be an excellent way to clue your reader in to how your fantasy religion works. You can also use language to hint at cultural taboos and/or preoccupations. In modern English we have a lot of terms with a nautical origin – ‘change tack’, ‘three sheets to the wind’, ‘loose cannon’ etc. In a fantasy society where they never had the Royal Navy but do have the Royal Dragon Corps you might find them using different terms – like ‘change wing stroke’, ‘three tails to the wind’, or ‘loose fire-breather’ for example. Language can be barrier to successful world-building, and it can also be a tool. Either way, it’s something that fantasy authors have to think about in a way mundane-world writers don’t have to. As with so many things about writing fantasy, it adds to both the challenge, and the enjoyment.